It’s no secret that I don’t get to as many tarot conferences as I would like. Being a full-time tarotist makes taking those sorts of working vacations a little tricky. Yet, when I was offered to opportunity to design a day-long professional development day with Jenna Matlin and Jay and Jadzia DeForest at the Northwest Tarot Symposium, I jumped at the chance. NWTS (affectionately called ‘Newts’) was a four-day affair, with an optional Friday that included a keynote by Mary K. Greer, and the ProDev Extension Day on Monday. I’ve noticed that, whenever I attend a conference, retreat or festival, there will be a theme that emerges, unbidden by me. I arrived midday on Friday. It became almost immediately clear that, beyond the enormous responsibility of organizing and presenting the Monday program, the theme of NWTS 2019 for me was going to be friendship. Over the course of the weekend I spent most of my time making new friends, rekindling old friendships and meeting some internet friends for the first time. 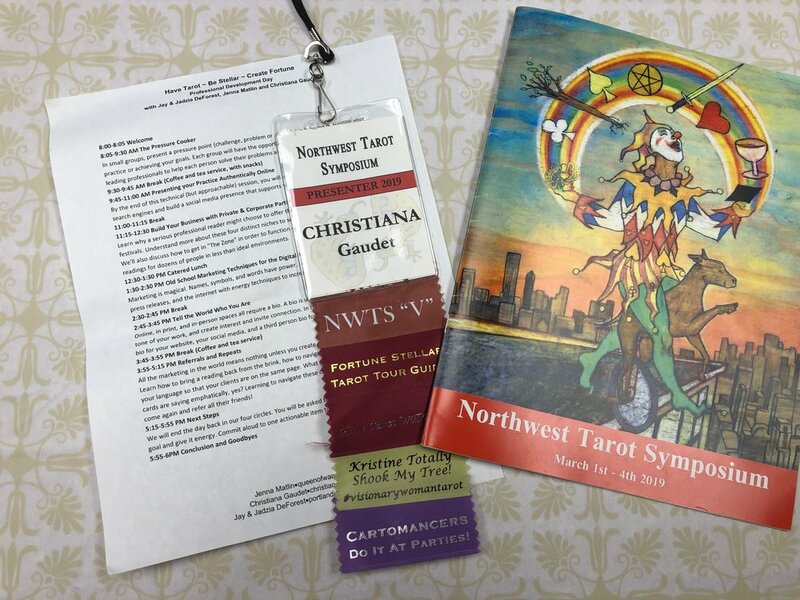 NWTS is the largest and most complex tarot conference I have every attended. In addition to running three options for classes at each timeslot throughout Friday, Saturday and Sunday, NWTS runs a full-on metaphysical fair, from 2 pm Friday until 5 pm Sunday. On Saturday and Sunday, the fair is open to the public. The quality of vendors and artists was astounding. It felt a bit unusual to have the vendors, readers and art show in an entirely different area from the classes. At every convention I have been to before there was at least one moment where virtually every attendee was gathered together in the same space. Not so with NWTS. One might think this would make the energy of the event feel fragmented, but that was not the case. Throughout the four days there was a constant feeling of opportunity for learning, connection and exploration, but an equal opportunity to chill, relax and spend time with tarot friends. I often say that your tarot friends are your best friends, because you speak the same language. I was reminded of this throughout my time at NWTS. I’m ashamed to say I didn’t attend a lot of classes, but I did fulfil a specific goal. I have been struggling with Lenormand for a few years. I decided to bring some Lenormand decks to NWTS, take the Lenormand classes, and make a final decision. Is Lenormand for me, or isn’t it? After the Sunday workshop featuring Mary K. Greer, Kendra Hurteau and Anne Walner, I can say that I Lenormand will indeed be part of my practice. Our Monday extension day ran from 8 am to 6 pm and was packed with great information for tarot professionals. I am so excited to have presented and organized the first-ever ProDev Extension Day at NWTS! A tarot convention can be a lot of different things. It can be a time to learn, a time to shop, and a time to play. It is certainly always a time to gather with kindred folk. For me, NWTS was all of those things, and more. If you love tarot and have the opportunity, NWTS 2020 will be open for registration in just a few short months. Christiana has been a full-time tarot professional for more than twenty years, and is the author of two books about tarot. In 2008, Christiana was granted the title of Tarot Grandmaster by the Tarot Certification Board of America. Christiana provides readings by phone, Facetime and Skype, and in her office in Palm City, Florida.